A genetically modified organism (GMO) is an organism, which is subject to an artificial genetic modification, i.e. a modification which has not occurred under natural conditions. The genotype of the GMOs is modified with the help of genetic engineering to highlight some of its features, to obtain new ones, to reduce or eliminate some of the unwanted hereditary characteristics. The first GMO was engineered in 1973. Adding genes of another species to the organism. The third group of changes is often subject of criticism and denial because in natural conditions it is extremely rare (the so-called horizontal gene transfer is possible but is observed at a very low frequency). Modification in crops to increase productivity, quality or resistance to diseases, pests, pesticides, etc. Examples of GMOs are wheat modified with a scorpion gene to be drought-resistant, strawberries modified with bacterial genes for longer shelf life, rice modified with daffodil genes to produce beta-carotene, etc. The most common plant GMOs in the world are soy, potatoes, corn, tomatoes, rice, etc. Selective breeding is breeding of plants or animals in order to selectively develop particular characteristics in the offspring by selecting males and females with the desired characteristics for reproduction. An animal breed and plant variety are artificial, man-made variations of the same species of animal or plant. In selective breeding, the breeder aims to retain only those characteristics of the breeds and varieties which are of interest and may be inherited. Various forms of selective breeding have been used since the dawn of human society. Unintentional selective breeding was carried out since the Neolithic Era. Later the unintentional selective breeding has become intentional, and in the meantime, many breeds and varieties have been created. Selective breeding aims to enhance certain target characteristics of the species. For example, in the selection of watermelon seeds needed for sowing for the next season, farmers always prefer to harvest seed of the largest and sweetest fruits. Determining the characteristics to be obtained. Excluding the individuals which apparently do not exhibit the desired characteristics. Selection and breeding of individuals with the desired characteristics. Selection of the most appropriate individuals for breeding. Through selective breeding were obtained cows with high-quality milk, different breeds of dogs and horses, numerous varieties of fruits, vegetables, cereals, fiber, and ornamental plants. GMO: GMO is an organism which is subject to an artificial genetic modification, i.e. a modification which has not occurred under natural conditions. Selective Breeding: Selective breeding is breeding of plants or animals in order to selectively develop particular characteristics in the offspring by selecting males and females with the desired characteristics for reproduction. GMO: The results of genetic engineering are detectable rapidly. Selective Breeding: A number of generations are necessary to obtain the desired results of selective breeding. GMO: Genes from one species can be inserted in other, non-related one. Selective Breeding: The individuals have to be from the same species. Selective Breeding: In selective breeding, genes combine on their own. GMO: The first GMO was engineered in 1973. Selective Breeding: Various forms of selective breeding have been used since the dawn of human society. GMO is an organism which is subject to an artificial genetic modification, i.e. a modification which has not occurred under natural conditions. The results of the genetic engineering are detectable in the first generation. A number of generations are necessary to obtain the desired results of the selective breeding. Via genetic engineering genes from one species can be inserted in other, non-related one. In selective breeding, the individuals have to be from the same species. 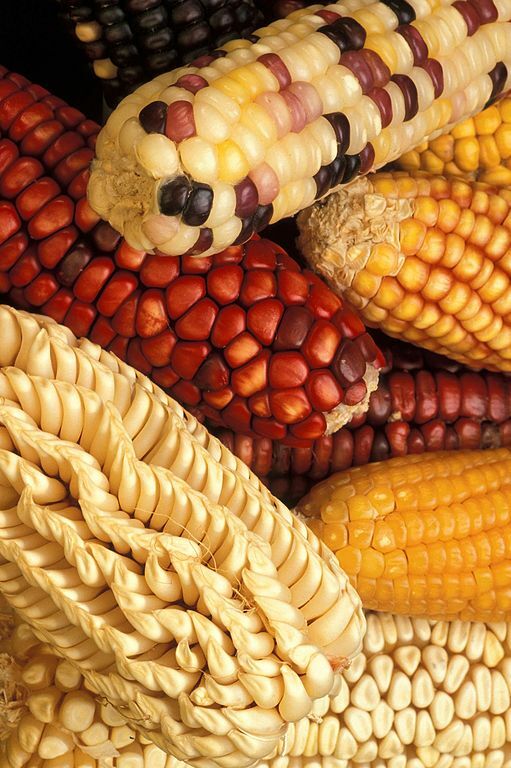 In GMO the scientists create new combinations of genes. In selective breeding, genes combine on their own. The first GMO was produced in 1973. Various forms of selective breeding have been used since the dawn of human society. Dr. Mariam Bozhilova Forest Research Institute, BAS. "Difference Between GMO and Selective Breeding." DifferenceBetween.net. 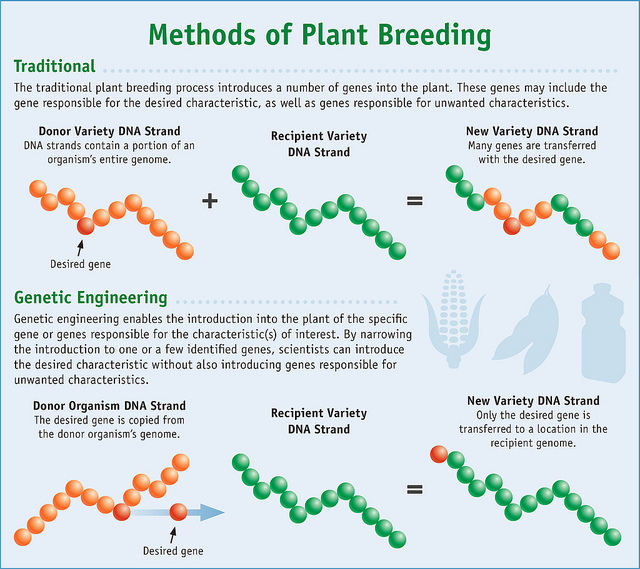 January 29, 2019 < http://www.differencebetween.net/science/difference-between-gmo-and-selective-breeding/ >. Ayala, J., J. Kiger. Modern Genetics. San Francisco: Benjamin-Cummings Publishing Company. 1989. Print. Klug, W., M. Cummings. 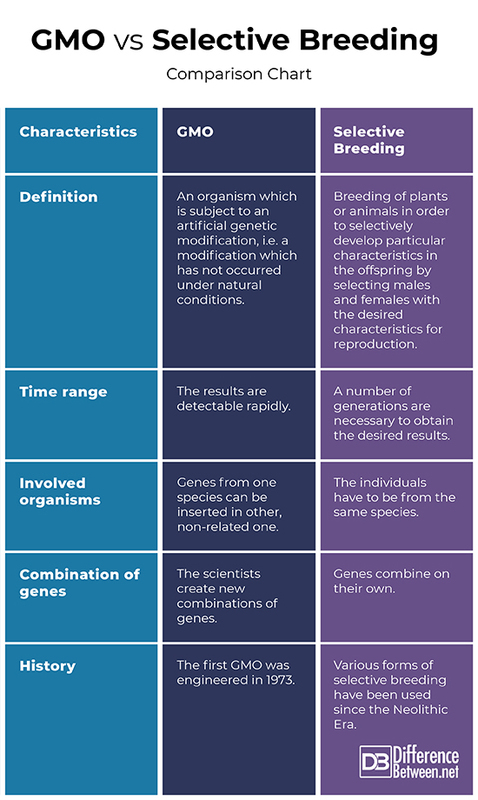 Concepts of Genetics (6th Edition). 1999. Print. Wood, Р., V. Orel. Genetic Prehistory in Selective Breeding: A Prelude to Mendel 1st Edition. New York: Oxford University Press. 2001. Print.